"Chatbots" are highly engaging computer programs through which voice and text messages become a part of a back-and-forth conversation between a user and a user interface. They have gained momentum in past couple of years for driving business outcomes in a cost-effective manner with improved customer experience. These bots can be customized and used on mobile devices, web browsers, and on popular chat platforms such as Facebook Messenger, or Slack. Eliza, the first chatbot ever coded, was then invented in 1966 by Joseph Weizenbaum. Eliza, using only 200 lines of code, imitated the language of a therapist. Unlike the Turing Test, there wasn’t any guessing game with Eliza. Humans knew them were interacting with a computer program, and yet through the emotional responses Eliza would offer, humans still grew emotionally attached to the program during trials. The program proved wildly popular in its time, but the same pitfalls that plagued the Turing Test plagued Eliza, as the program’s coding was too basic to reach farther than a short conversation. What was made clear from these early inventions was that humans have a desire to communicate with technology in the same manner that we communicate with each other, but we simply lacked the technical knowledge for it to become a reality at that time. However, please note that it was Michael Mauldin who originally coined the word "ChatterBot" in 1994 to describe these conversational programs. In this so-called digital era, businesses today have more ways than ever before to connect with their customers. According to some reports, as 80% of businesses either using them already or planning to by 2020, the emerging challenge is how to integrate this technology whilst maintaining an authentic "human touch". Much like a human assistant, a chatbot uses natural language processing (NLP) to dialogue with customers: it can ask questions and understand answers, identifying all the relevant information in the conversation in order to automate and effectively empower the customer assistance process. According to the latest findings by Gartner Research, chatbots driven by artificial intelligence (AI) will play more important roles in interactions with consumers, within the enterprises, and in business-to-business situations.With the rise of chatbots, brands can fulfill the promise of social media: personal, trackable, scalable conversations and insights directly from the people your organization is aiming to serve. Although chatbot adoption is low among marketers, there still are anecdotal examples of big brands using bots, like the Starbucks barista bot that can order customers drinks and the Staples bot that confirms orders. As Pete Rojwongsuriya of Travelistly told Forbes, "Bots have been around for ages but the reason why it is trending now is that the advancement of AI seen on products such as Google Assistant and Siri that have gone beyond a fad to become a useful product with real impact on the mass." Smooth communication encourages consumers to give more detailed accounts of what works and doesn’t work for them. But, before anyone starts implementing chatbots into their marketing campaigns, it’s important to know that there have been customer complaints to let businesses know that chatbots aren’t quite human enough for us just yet. That is exactly how Prof. Amanda Turnbull, (Assistant Dean, Faculty of Law, University of Ottawa) summarizes it through an insightful sentence in one of her latest article, recently published at The Conversation -"A "perfect" chatbot would not only look at the meaning and use of words but also the consequences of what it says." A big barrier to customers using chatbots is that they are often unsure whether the bot will be able to meet their specific needs. Being specific about what it can and cannot do is always going to be a challenge, despite the growth in AI technologies. The second biggest skepticism is about the overlapping of conversation when a customer service representative with bots transcript takes over the communication. The repetition of information to the customers is always a possibility which might hurt the overall positive emotional sentiment of the latter. It is imperative that chatbots should identify when customers need to speak to live representatives as early in conversations as possible — and make the transfer seamless. 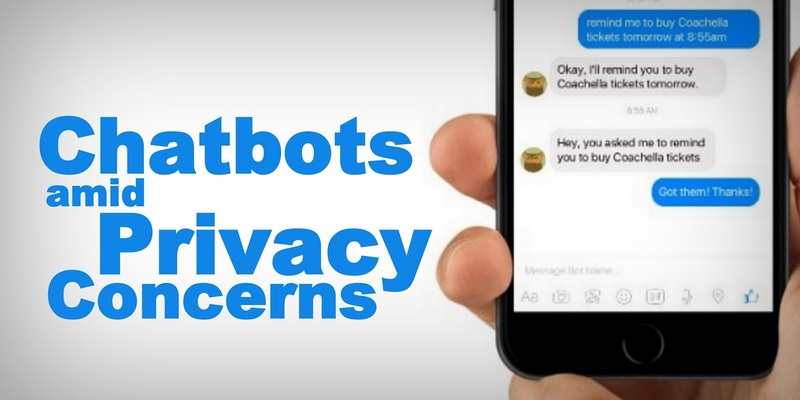 At the same time, propelled by recent privacy concerns in web and social media, businesses are also facing a new kind of dilemma (earlier which was there in their subconscious mind) in deploying chatbots as an efficient way to engage customers. In a business world in which customer service, especially timely and relevant communication, is the most important factor to success, chatbots seem to be an optimal solution. But, for those with privacy concerns, keep in mind that most virtual assistant software is designed to collect personal data. According to Lauren Kunze, CEO of Pandorabots — we're going to see a lot of emerging dialogue around privacy and security that we have not seen to date, just in terms of how that data gets stored and who is accessing it. Larger enterprises that carve out specific parameters around how one can use the data like, -- "do we delete the data after a few months, or do we have to run on HIPAA compliance servers in some cases?". It's something to be mindful of that's going to be a big issue going forward just because it's an all-together a new paradigm and conversation is the most intimate sphere of how we interact.